Plaque showing a medallion of Lord Lister, by Margaret May Giles, in a circular ebonised frame. 1898. Credit: Wellcome Library, London (M0002779). Available on this Creative Commons licence. In fact the Wellcome Library says that it was "executed by Miss Fleeming Jenkins at the request of Lady Lister." However, this same image is cited, along with wax and plaster versions of the relief by Giles (111 mm in diameter), in the National Portrait Gallery's catalogue: the gallery's versions were presented to it by Giles herself. The confusion over the name seems to have begun in the catalogue of the Lister Centenary Exhibition in 1927. It stems from the fact that Giles married Bernard Maxwell Jenkin (not Jenkins) in 1898, in the same year in which this work was completed. Jenkin was the son of Henry Charles Fleeming Jenkin, the famous professor of electrical engineering at the University of Edinburgh. Giles designed medallions of various scientific personalities, including a matching pair for Lister and Kelvin, around that time (see Blackett-Ord). 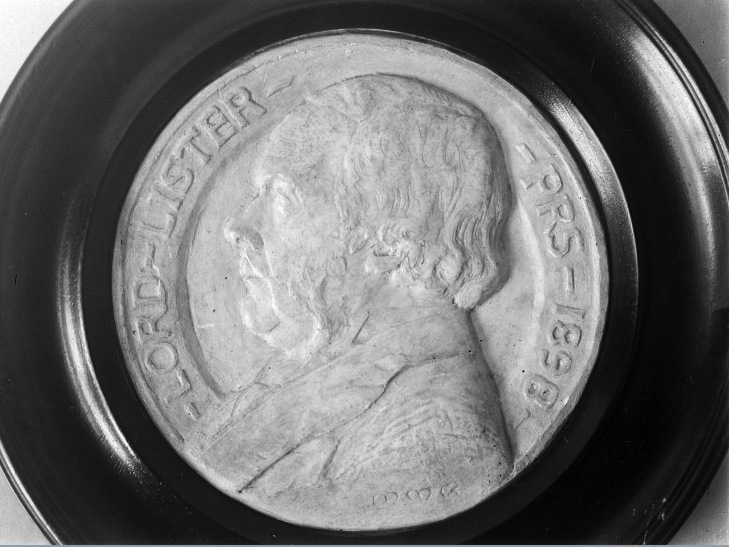 The wax medallion of Lister at the gallery is mounted on slate, and carries the same inscription: "– LORD – LISTER – PRS – 1898 –" with "M.M. Giles" below the left shoulder. Only the forename initials can be seen clearly in the reproduction above. "Antiseptic Surgery Stamps." BFDC (British First Day Covers). Web. 1 April 2017. Barkley, Gareth E. "Jenkin, (Henry Charles) Fleeming (1833–1885)." Oxford Dictionary of National Biography. Online ed. Web. 1 April 2017. Blackett-Ord, Carol. "Joseph Lister, Baron Lister." National Portrait Gallery entry. Web. 1 April 2017.